A prosthodontist is a dentist who has undergone extra training to become qualified in dental prosthetics. Therefore, they are the best person to turn to when you have misshapen, broken, or missing teeth. They can create beautiful new teeth that as functional as they are attractive. “But, can’t a regular dentist do that?” you might ask. It’s true that most dentists are qualified to handle simple prosthetic cases. For example, they may be able to design and create crowns and some dental implant restorations. However, they lack the training to handle more complex situations. You have lost one or more teeth. A prosthodontist will examine your mouth and recommend the best way to fill in those gaps. You may need a fixed bridge, a full or partial denture, or dental implants. You are a bit older. As the years pass, our bodies may go through changes that make it more challenging for a dentist to replace missing teeth. If you have quite a few decades of experience behind you, it would be wise for you to visit a prosthodontist who has the expertise needed to handle your case with skill and compassion. Your child has congenital missing teeth. For various reasons, some children never develop all their teeth. A prosthodontist can work to give your child a complete smile. You’re experiencing jaw pain. Prosthodontists are very familiar with the way the muscles and joins around the mouth work. If you are suffering from a TMJ disorder, Dr. Geller may be able to relieve your pain. You have obstructive sleep apnea. A prosthodontist can design an oral appliance that will reposition your jaw at night and help you breathe easier. You’re recovering from oral cancer. This disease can take a devastating toll on your smile’s appearance, but a prosthodontist can help restore your smile and your confidence. You don’t like the way your smile looks. If your teeth are misshapen, broken, or otherwise unattractive, a prosthodontist may be the perfect person to make over those pearly whites. What do you think? 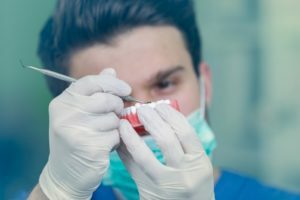 Is it time for you to visit your prosthodontist in Hancock Park? Dr. Benjamin Geller is a highly skilled prosthodontist who takes great pride in helping his patients achieve attractive, functional smiles. If you believe you could benefit from a dental prosthesis, please contact our office at 323-467-1472.